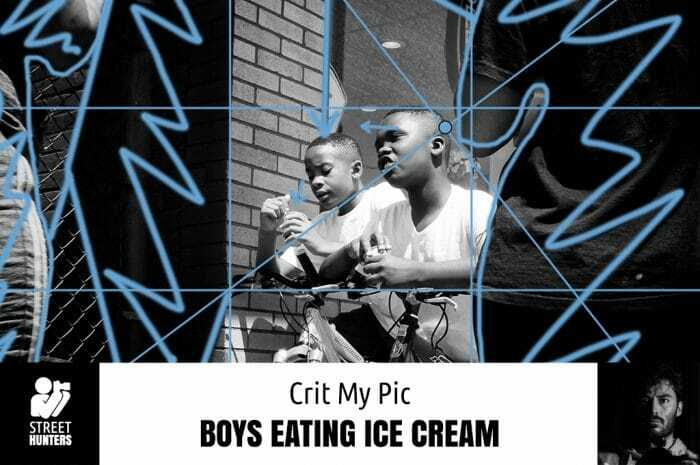 For this week’s Crit My Pic I’m going to review a street photo by Rich Barbara titled ‘Boys Eating Ice Cream’. Rich actually contacted us over a year ago with a photo submission, but at that time we’d suspended Crit My Pic for a while. Now the feature has returned I can get around to analysing Rich’s work! So sorry about the delay Rich, and thanks for your patience! I’ll be looking at Rich’s street photo across a variety of parameters, such as point of view, focal point, composition, exposure, subject matter and mood. So read on for my analysis, and if you’d like me to analyse your photo, check out our rules below for submitting your photo to Crit My Pic, and then get in touch! Rich chose an interesting point of view for this photo, and it’s one I’d describe as being both classically photojournalistic and also emblematic of street photography. ‘Boys Eating Ice Cream’ has been shot from a low angle, which marks a refreshing departure from the standard adult head height perspective we’re used to seeing in 90% of photos, and instantly makes this photo distinctive and interesting. In fact, Rich has shot this from roughly just below the level of the focal point of the image (the boys) which serves to draw the eye into the centre of the image. As I’ve mentioned, the boys eating the ice cream are clearly the focal point of the image, and Rich has used several factors to help make this very obvious to us as viewers, making this a very strong photo and one free from clutter. For instance, the boys are roughly in the centre of the photo, not hidden away right in the corner of the frame. 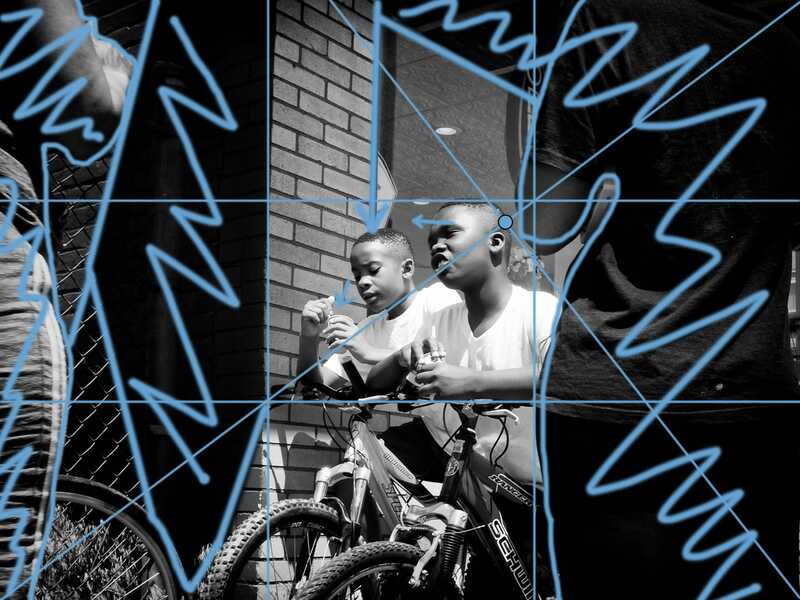 In fact, they manage to occupy both the centre, rule of thirds, and ‘golden ratio’ segments of the photo at the same time, making for maximum visibility, but I’ll discuss more about Rich’s use of composition to emphasise the boys as the focal point later. Another factor which clearly helps to signpost the boys as the image focal point is the fact that theirs are the only faces shown in the photo at all, and they are also the only easily identifiable people in the whole shot. The presence of others is hinted at by the backs of the two bodies framing each side of the photo, but as we only see portions of these bodies they appear very abstract, and we’re more inclined to continue focusing in the centre of the frame. Rich has also taken advantage of how the human brain works to make his focal point clear – he evidently understands well that our eyes seek out faces when looking at a photo as this is how we naturally communicate with one another. As the only faces in the whole shot belong to the boys, this is where our eyes are drawn to. The composition of ‘Boys Eating Ice Cream’ is excellent. I’ve overlaid a ‘rule of thirds’ grid and golden ratio guidelines to show just what a clever job Rich has done with this photo. As I’ve already mentioned, the boys are the focal point of the shot. As one boy is slightly in front of the other, it is the boy who appears closer to us that occupies our attention first. Looking at composition, we’re able to understand why. This boy looking up and across is placed close to one third of the way across the frame, and as we know from the general rules of composition, this draws our eye and makes the shot more attractive as it ‘unbalances’ it. Now look at the small circle which marks the golden ratio when applied to this photo. You’ll see the top of the boy’s right ear sits almost exactly at this point. Not only is the human eye drawn to faces, but it is drawn to features in particular, so we notice the ear and the rest of the boy’s head at the golden ratio point and this makes for a well arranged photo with visual impact. Our focal points are placed exactly where they should be to make the photo pleasing on the eye. When I delved further into the composition of this shot I was even more impressed. I naturally moved across the frame and the boy’s face to his eyes, and I was instantly curious as to where he was looking, as he seemed to be communicating with someone. His eyes led me over to the centre of the photo, where I stopped because there was the face of the second boy. Not only are we led over to him by beginning to follow the first boy’s eye line, but also by the lines of the building! I’ve drawn an arrow to show how the edge of the brick column perfectly points to the centre of the boy’s head. Then I began to follow the direction of this boy’s eye line, and saw he was eating ice cream. Naturally I was curious if his friend was eating some too, so my eye returned to the boy on the right, and my suspicions were confirmed. Then I returned to the first boy’s face and the fact he was talking prompted me to journey across from the right to the left of the frame again, where I saw the mysterious outline of the figure on the left of the shot. Great use of composition to tell a story Rich! Another composition element Rich has used very well in this photo is negative space. You can see from my scribbles that negative space dominates both the left third of the photo and the final third on the right. In fact the line of the building creates a strong border with the block of shadow in the left of the frame that sits exactly on the one third line. Looking to the right, we see that both the hip and elbow of the shadowy silhouette on the right of the frame also sit on a one-third line. Essentially Rich has used areas of negative space placed precisely in accordance with all the compositional guidelines to focus our attention clearly in the centre of the frame. Very clever! The effect of the negative space is further emphasised by Rich’s choice to shoot this photo in black and white. Reducing the image to simple areas of light and dark really makes the shadows work to his advantage, while the bright white of the boy’s t-shirts brings them clearly to the forefront of the shot, and again clearly defines them as the focal point. The exposure and lighting is very good – notice how the light is falling across the boys’ faces from camera right. This leaves the left side of their faces in shadow, which always makes a face more interesting and mysterious, and also serves to help emphasise features, making them more obvious and dramatic. The exposure leaves the backs of the two figures at the left and right sides of the frame largely in shadow so they work well as a frame without being too distracting, but there is just enough exposure to pick out the edges of their bodies so they don’t appear too abstract. I would have been interested to see what this photo looked like in colour though. It’s possible that if there were very vibrant colours in the scene emphasised by the strong sunlight this shot would have been even more powerful. However, I don’t know exactly what the colours were as Rich saw them. It’s possible there were too many drab muted hues which may have proved too distracting for a colour shot – I have no way of knowing! 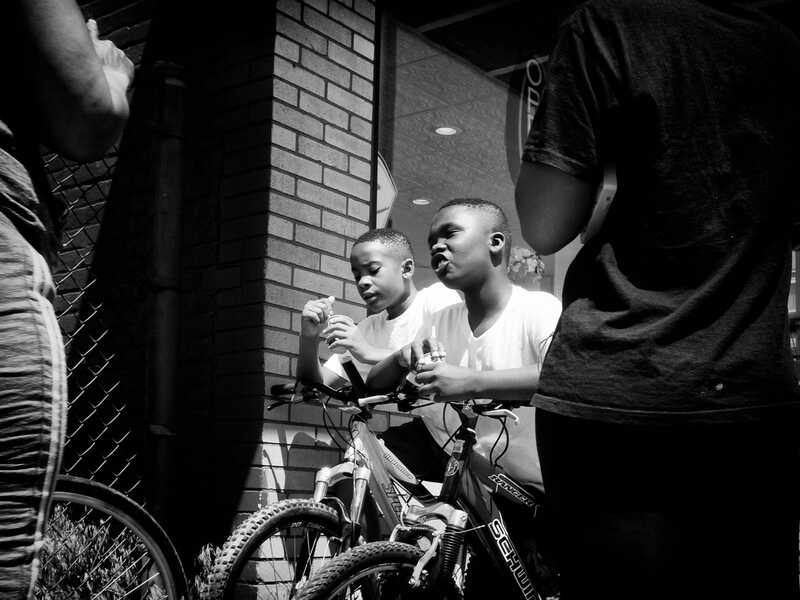 With the boys, bikes, a modern brick building and a chain link fence, this shot has a very urban feel. I can just imagine the boys riding their bikes on the pavement (sidewalk) after having bought some ice creams from a corner shop and then they’ve been approached by someone or stopped to talk with some friends, or people they knew. This photo feels so strongly ‘street’ to me – the low angle, the boys, their clothes and bikes look like something you’d see in the centre or suburbs of an US, UK or French city. To me, this shot perfectly epitomises the modern Atlantic-centric urban street scene! Shooting from the angle he did and framing as he did, Rich has managed to make his photo both voyeuristic and immersive. Neither are criticisms – I love the gritty feel of this shot, and the sense that I’m seeing life unfold before me – it really gives me a feel of the city. Rich’s framing and composition also heavily influence the mood of the photo, and leave us asking questions, which is always interesting. We can only see the boys, and we can’t entirely tell who the first boy is talking to. Is he talking to the shadowy figure on the left, or is there someone behind them? The low angle and perspective lend an extra element of mystery to the silhouetted figures. We can’t tell how tall they are so it’s hard to guess their age or their gender. Are they adults? Is this a confrontation? A conversation? We don’t know. This mystery makes the shot interesting, and Rich has left us wanting more. Perhaps to further play on this theme he could have shot from an even lower angle and shown a tiny bit more of the figures at each side of the photo. This may have further emphasised the perspective effect in the shot and added an extra element of menace to the silhouettes by making them look even bigger in relation to the boys. I was impressed by what Rich has done with this photo. He’s shown a fantastically skilled and nuanced understanding of composition, focal point, subject matter, and lighting to create a very good street photo. The angle he chose also shows that he was bold, as he’s moved in quite close and low to his subjects. The bravery and imagination to make a shot like this is to be commended. As I’ve said, I would perhaps liked to see the effect of this shot in colour to see if it had more impact, but having not seen the original scene for myself I can’t necessarily label this as a criticism – the actual colours may have been too dull and made the photo too busy and distracting. As it is, the shot strikes a good compromise between having enough elements to keep the shot interesting and reward the viewer with a closer look, but not so many that it gets cluttered. A lower angle and more of the silhouette figures may have made them appear more intimidating in the photo, and that approach may be worth experimenting with in the future. That said, I think this is a brilliant slice of city life captured in a street photo – well done Rich! Please submit one of your photos to contact@streethunters.net. If we can make this a successful long-term feature I’d love for you to submit a second photo after 6 months or so, in order to see your progression, but for the time being please, submit one photo per person. Please give your photo a title (so I have a way of referring to it in the analysis). Let us know if you want to remain anonymous. We will default to publishing your name in the analysis. If you would rather remain anonymous please tell us. Photo critiques will be published in public in the ‘Crit My Pic’ section of the streethunters.net blog. This is allows all streethunters readers to learn from the analysis. The date your photo is published will depend on the volume of submissions we receive. If we have lots of submissions it will take me a while to get to your photo, if we don’t, then it will get analysed sooner! For the time being, we plan to publish one photo analysis every two weeks on a Thursday. Please submit your photo in JPG format, max image width 2048 (I may want to zoom in to check out some details).